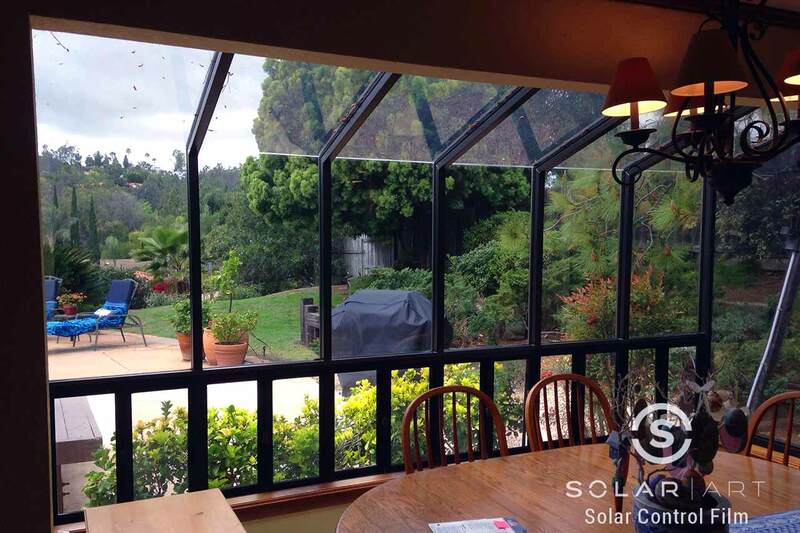 Solar Art installed Huper Optik ceramic window film to a home in San Diego, California! The customer has views of beautiful green hills that they can see in several windows throughout their house. Being in southern California, windows let in a large amount of heat and glare during all seasons of the year. This customer was looking for a way to reduce the amount of heat and glare that enter their home without having to give up their beautiful views. They had Huper Optik ceramic window film installed in both upstairs and downstairs room to keep a uniform look and maintain views throughout the home. Reflective window film and dual reflective window film are great heat blocking window films but they contain metal and dye, which means they have a tint to it. Reflective window films look like one way window film or mirrored film and reduce the amount of natural light that enters making a room darker. Huper Optik ceramic window tint contains no metal or dye and is optically clear. Ceramic window film controls heat faster than reflective window film. Huper Optik film will still allow in natural light and keep any room bright all while not hindering views at all. Huper Optik ceramic can reduce up to 75% of heat that enters a space and protects against 99% UVA and UVB rays. Being a heat blocking window film, ceramic window film can reduce electric bills because the air conditioning can be used significantly less throughout the year. This installation was installed at a residence, but ceramic film looks great in a commercial setting as well. Solar Art has done several installations in private offices as well as whole commercial buildings. Interested in Ceramic Window Film? Contact us directly to talk with us about Ceramic Window Film! Huper Optik Ceramic window film is one of the newest technologies in the window film industry. This is a great product to help reduce fading of wood floors, furniture and more. Contact Solar Art to learn more!